Looking for Homemade Pizza Ideas? Want to Make Pizza without yeast? 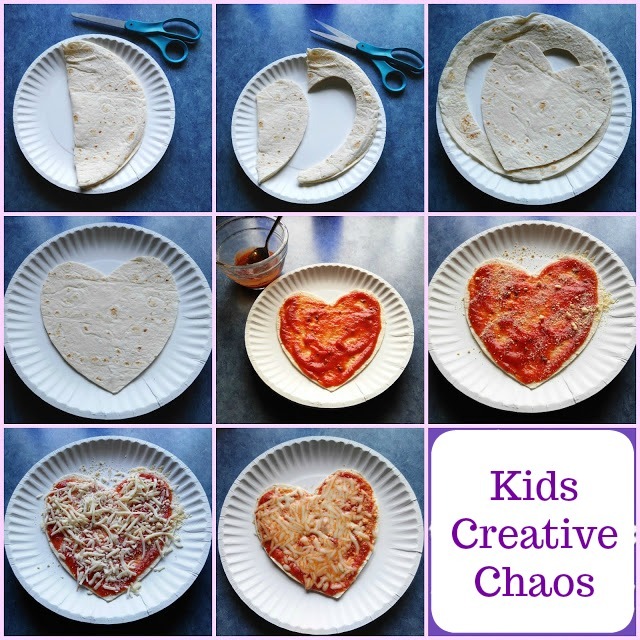 This Heart Shaped Pizza is simple and super easy to make with kids. No oven needed. You can microwave it or bake it on the stovetop! We cook ours on the grill. Enjoy! Homemade Heart Shaped Pizza without Yeast. So how do you make a pizza without yeast? It is easy, and you can make a gluten free pizza too! Grab you kitchen shears and some tortillas! This is so easy, it makes the perfect activity for a kid's birthday party! See pictures above to follow these simple steps. Fold your tortilla in half, then cut out half a heart. Add toppings like Pepperoni, Green Peppers, or Pineapple. Spray grill or skillet with Cooking Spray. Heat grill or skillet on high heat. Place Heart Shaped Tortilla Pizza on Grill until Cheese melts. *You can also microwave the pizza just until cheese melts. This takes less than 1 minute, so watch it closely. Make pizza on the stove top.